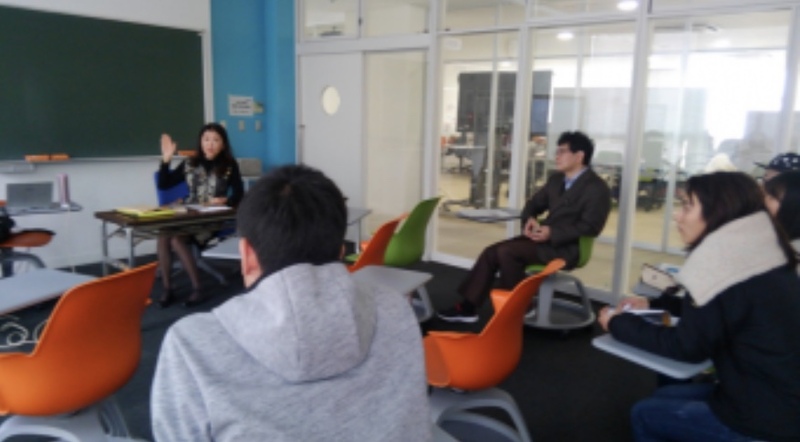 I gave Hachiko lectures to Chiyoda International School students 2nd, 3rd and 5th grade students. They were very interested in Hachiko’s story and I enjoyed talking to the children very much. To celebrate the 70th anniversary of the erection of the current statue of Hachiko, this very unique exhibition had organized by the Shibuya Folk and Literacy Museum. I donated an old magazine with the picture of Helen Keller touching the statue of Hachiko (photographed in 1948) and loaned photographs from the collection I exhibited in New York and Los Angeles. Helen Keller and Hachiko Exhibition will continue till March 23rd 7:00 pm. Please come see rare pictures and letters on Helen and Hachiko. Helen Keller and Hachiko Exhibition preview Night was held on March 8th, the 83rd anniversary of Hachiko' s death. 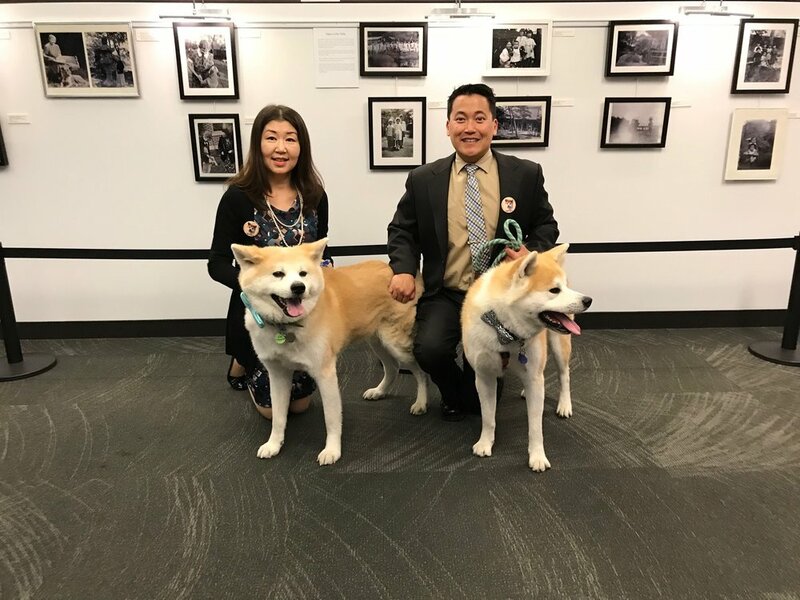 I gave a talk on Helen Keller and Hachiko's relation and Dr. Steven Takamatsu, the President of Akita Dog Preservation Society in the US gave a lecture on Akita dogs. He brought three Akita dogs and the participants pet the dogs and took pictures with them.The producer of the Hollywood movie "Hachi. A dog's tale", Vicki Shigekuni-Wong joined us. I enjoyed talking about Hachiko with her! It was a wonderful event to share the story of Hachiko with many people in Los Angeles area. The exhibition introduced rarely known relations between helen keller and Hachiko through historic pictures and letters collected from Tokyo, Akita, New York, Westport and Boston. Helen Keller and Hachiko Exhibition gallery talk for press was held. After my speech on the connection between Helen Keller and Hachiko, several guests gave nice speeches. Jennifer Hale from the Perkins School for the Blind, Heidi Conkling from Abbey Glen Pet Memorial Park, Diane Lynch who gave me the 1948 ' Mainichi Graphic' that has a wonderful image of Helen Keller and the statue of Hachiko, JoAnn Dimon, President of the Big East Akita rescue and Mark Ackerman , Executive Vice president of Lighthouse Guild were the speakers. It was a wonderful event! My exhibition 'Helen Keller and Hachiko' at The Consulate General of Japan in New York started! I attended Shibuya Festival Akita Inu booth. My article "Helen Keller and Kenzan" appeared in the "Akita Inu" magazine special 500 issue. The Akita Inu Preservation Society celebrated its 90th anniversary. I visited the Akita Inu Hozonkai (Akita Dog Preservation Society) in Odate, Akita and met with the staff and Akita dogs. I met the Mayor of Odate, Akita, Mr. Junji Fukuhara at Odate City Office. We talked about Hachiko friendship project between Japan and the US. The 82nd Hachiko Memorial Ceremony was held at the statue of Hachiko in front of Shibuya station. The Mayor of Shibuya Mr. Hasebe, the Mayor of Odate, Mr.Fukuhara, the Chairman of the statue of Hachiko Committee, Mr. Kamijo and people who have connections to Hachiko and several Akita dogs attended the special ceremony to pay tribute to Hachiko. I went to the American Kennel Club "Meet the Breeds". I met many dogs and off course I spent a lot of time at Akita dog booth where B.E.A.R. ( Big East Akita Rescue) presented wonderful Akitas. I visited Odate, Akita, Hachiko's birthplace and the origin of Akita breed. I went to see the Akita dog Exhibition at a park in Ariake, Tokyo. This exhibition was organized by the Akita Dog preservation Society. I was interviewed by Yomiuri newspaper journalist regarding Hachiko. I had a meeting with the mayor of Shibuya, mr. Hasebe regarding Hachiko. I worked as a producer to erect the statue of professor Ueno and Hachiko at Abbey Glen Pet Memorial Park. The statue is the reproduction of the statue at the University of Tokyo which was erected on March 8th, 2015. The unveiling ceremony was held at Abbey Glen and 200 people and 3o dogs attended the ceremony. I had a meeting with the Ambassador Takahashi at the Consulate of Japan in New York . I talked about Hachiko and introduced the American Akita "Kumo". I talked about Hachiko and the 1930s Tokyo at Nichibei Exchange in New York. We watched the movie "Hachi" staring Richard Here at Westport Senior Center and talked about Hachiko and the era. I gave a talk about Hachiko and the 1930s Tokyo at Yale School of management. I gave book talks on Hachiko and Shibuya at 8 classes for American School in Japan middle school and high school. 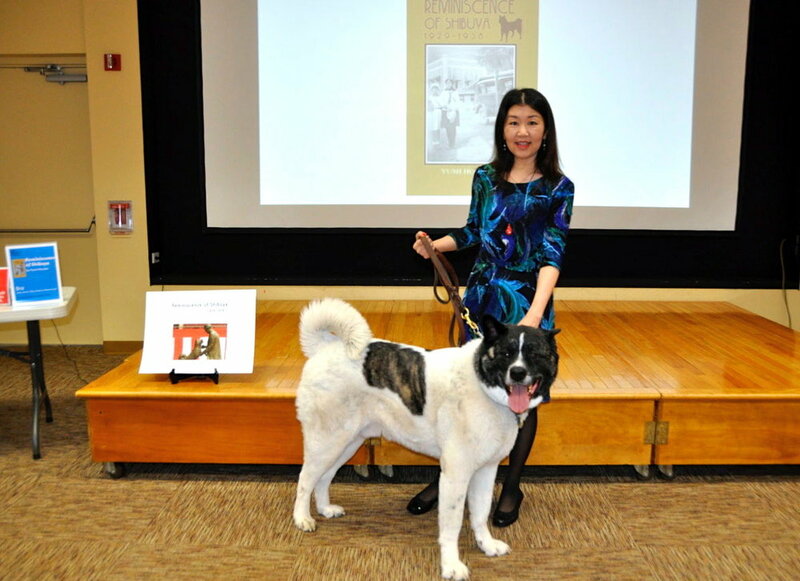 I talked about my book "Reminiscence of Shibuya at Westport Library with Akita dog "Kumo"!